“From the moment I knew my first baby was a girl I started to plan, hope and dream. I couldn't wait to experience that special bond, but I wondered how I'd feel about being a working mum, how I'd hold on to the person I am. “I also knew that the world has changed so much since I was growing up. What advice, values and role models would help give my daughter the confidence and strength to cope with all that might come her way - and to give her an open mind and warm heart? The book is based on themes of motherhood, with Katie and her mum discussing what people learn as a mother and the things they would tell their daughters. 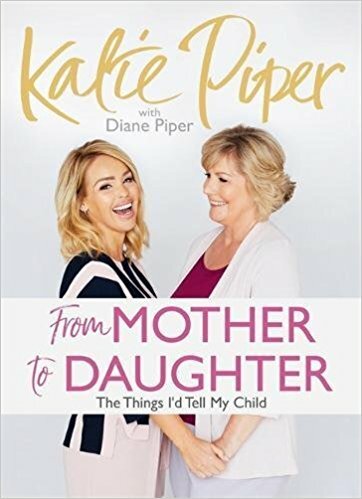 Most of all, the publishers say, it's Katie and Diane Piper's celebration of the incredible power of mother-daughter relationships. It’s not the first book that Katie has written - in fact, she has a string of bestsellers under her belt already. The autobiographical “Beautiful”, “Things Get Better” and “Beautiful Ever After” are joined by “Start Your Day With Katie: 365 Affirmations for a Year of Positive Thinking”, a successful self-help book. Katie first rose to fame after speaking out about her experiences as the victim of an acid attack by a former partner. The cowardly attack left her badly scarred and needing regular surgeries, but Katie’s positive attitude and bravery shone through in interviews to make her something of a national treasure. Now regularly doing presenting work for ITV and others, she’s a mum of two to boot. Katie Piper’s new book is available in print and as an audiobook on February 22nd, 2018, making it a great time to book her. As a confident and bubbly presenter, she’s available for all sorts of presenting work for events of all sizes. She’s also a highly recognizable and much-loved face who would be the perfect brand ambassador for all sorts of products and services. If you’d like to hire a celebrity like Katie, get in touch with us here at MN2S to see how we can help. This sounds like a very inspiring and touching book. Will read it when I get the chance! Thanks for sharing!